No. 8 Florida has every reason to believe it can pick up where it left off after reaching the Final Four a year ago and three Elite Eights in the three seasons before that. The core of Scottie Wilbekin, Patric Young and Casey Prather are gone, but Billy Donovan has a several players ready to step into starring roles. 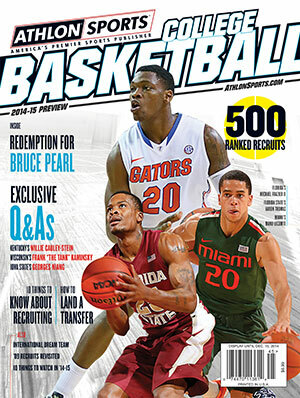 The Florida edition is one of dozens available in our online store and on newsstands everywhere now. Coach Billy Donovan’s Florida Gators reached the Final Four in 2013-14 by winning the old-fashioned way. In a time when one-and-done phenoms command center stage, the Gators won a school-record 30 straight games led by four seniors with a combined 547 games played at UF. Donovan now looks to replace the reigning SEC Player of the Year (point guard Scottie Wilbekin) and SEC Defensive Player of the Year (center Patric Young), along with All-SEC small forward Casey Prather. That trio, plus forward Will Yeguete, accounted for more than half the team’s points, but more important, they anchored a defense that allowed just 57.8 points per game. Still, the future remains bright in Gainesville. The 2014-15 Gators will be more athletic and explosive than the team that lost to eventual champion UConn in the national semifinals. UF returns one of the nation’s best 3–point shooters, guard Michael Frazier II, ultra-versatile forward Dorian Finney-Smith and two sophomores, point guard Kasey Hill and power forward Chris Walker, who were 2013 McDonald’s All-Americans. With Donovan’s penchant to develop winners, the Gators should challenge for their third straight SEC crown despite the senior losses. The 6-10, 250-pound Young was three-year starter and a fixture under the basket. But he was prone to lapses of inconsistency and finished his career with just 11 double-doubles in 150 games. The 6-8 Finney-Smith actually led UF in rebounding (6.7 per game) last season coming off the bench. If the 6-10 Walker develops as expected, he will provide a superior shot-blocking presence to Young. Still, Young’s post defense was as good any player in the nation, while his hustle will be impossible to replace. Yeguete was a hard-nosed defender, strong rebounder and garbage man on offense. Michigan transfer Jon Horford, the 6-10 younger brother of Gators legend Al Horford, will look to fill Yeguete’s role. Prather led the team in scoring (13.8 ppg) and the SEC in field goal percentage (.603) with his slashing style. Duke transfer Alex Murphy, who will sit out the first semester unless granted an NCAA waiver, will provide scoring punch as a stretch-4 similar to his brother Erik, an All-SEC player at UF in 2012-13. Freshman Devin Robinson can fill it up, too. The key to the Gators’ inside game will be Walker. A top-10 recruit in the Class of ‘13, Walker initially failed to qualify academically and then served a 12-game NCAA suspension for receiving improper benefits during his AAU career. Walker lacked strength at 212 pounds and a feel for the college game. He averaged 1.9 points, 1.3 rebounds and 4.8 minutes, but he has added 15 pounds this offseason and will be expected to man the middle. Wilbekin was playing as well as anyone in the nation until he ran into UConn All-American Shabazz Napier during the Final Four. Wilbekin’s on-the-ball defense, clutch shooting and leadership will be missed. Hill plays a different game, using his blinding speed to create seams on drives to the basket and open shots for teammates. But Hill’s outside shooting and defense have a long way to go. Dynamic freshman Chris Chiozza is undersized but explosive. He is expected to back up Hill. Frazier set a school record with 118 3-pointers but struggles to create his own shot. He vastly improved his defense as a sophomore and likes to mix it up on the glass. Frazier averaged 3.5 rebounds. Gifted freshman Brandone Francis should provide additional scoring once he learns the college game. The Gators’ backcourt will get a major boost if guard Eli Carter returns from a lingering leg injury. Carter averaged 14.3 points during two seasons at Rutgers, but broke his leg late in his sophomore season and sat out last year at UF. It is a credit to Donovan’s coaching and recruiting that the Gators should contend for another SEC title. The losses are huge, but the talent is there for UF to make another deep NCAA Tournament run, too. While last year’s team leaned on its defense, clutch scoring and competitive fire, the ’14-15 Gators should be an up-tempo team that will be entertaining to watch. Whether it can win close games will be the key to the season. Florida was 15–2 last season during games decided by fewer than 10 points. Jon Horford, a transfer from Michigan, should provide a physical presence off the bench, while Alex Murphy, a transfer from Duke, will offer scoring punch from the perimeter. Devin Robinson was rated a five-star recruit by some services and will be in the rotation. Brandone Francis is a physical specimen, but remains a bit raw. Chris Chiozza is a playmaker who will spell Kasey Hill.